As a member of your local food co-op, you know the difference that co-ops make in your community. And as part of our celebrations of the Co-operative Decade, the Neighboring Food Co-op Association is profiling other businesses that are building a thriving co-operative economy. One example is the Mt. Sterling Co-op Creamery, founded in 1976 when a group of Wisconsin farmers got together to make raw cheese from their goats’ milk. Goat’s milk and goat’s milk cheese was solidly outside the mainstream at the time, but the Co-op slowly built a following for their product and now, more than thirty years later, has grown to twenty member farmers and distributes the Mt. 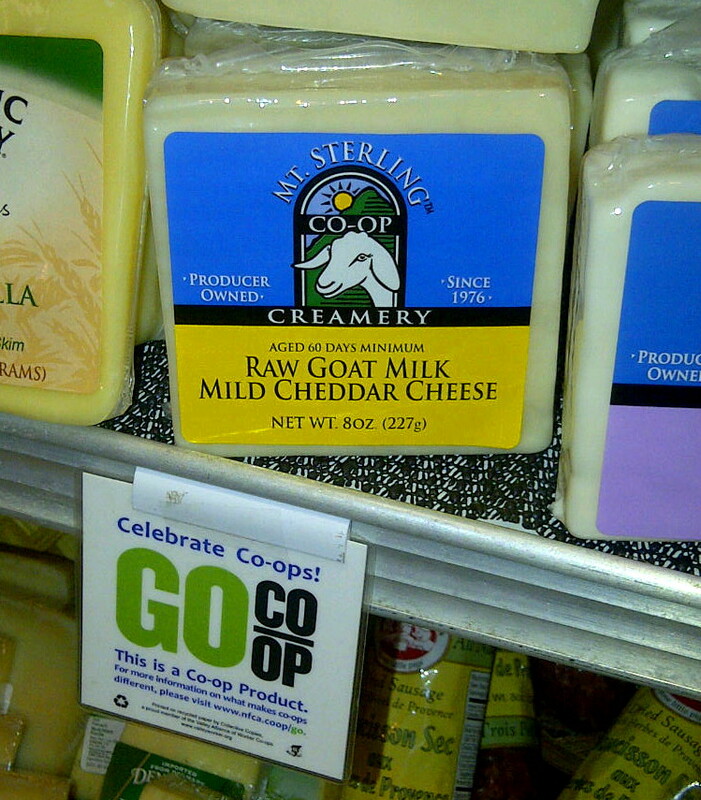 Sterling brand of award-winning raw goat cheeses to food co-ops and grocery stores across the country. Members, whose farms are in southwestern Wisconsin and just across the Mississippi River in nearby Iowa and Minnesota, focus on caring for their herds and producing high quality milk. Their co-op then manages the logistics of collecting the milk and transforming it into cheese at their factory in the town of Mt. Sterling, Wisconsin. “Most of our members are what we consider medium-sized producers,” says Mt. Sterling Marketing Director Patricia Lund. “They average 150 to 200 goats – it’s a good size to make a reasonable profit, not too big, not too small.” All of the milk in the Mt. Sterling’s cheese comes from members. Unlike many larger cheese processors, they don’t buy frozen cheese curds to add to their members’ milk when they find themselves short on supply. Instead, they focus on finding new members for the Co-op. In addition to being a staff person, Lund has been a member of the Co-op since 1990. She grew up near the town of Mt. Sterling and recalls being married with young children and wanting to do something that would allow her to stay home with her kids. She laughed as she recalls saying to her husband, “I won’t do pigs and I won’t do cows.” Around this time she met up with some acquaintances at an agricultural fair that were Mt. Sterling Co-op members. “I didn’t even know at the time that you could milk goats commercially,” she says. But managing a herd of goats felt like a perfect fit for her and her family. To learn more about the Mt. Sterling Co-op Creamery, visit: www.buymtsterlinggoatcheese.com. Kristin Howard works with Franklin Community Co-op (www.franklincommunity.coop) in a variety of capacities, including writing for the newsletter, board administration, and marketing.